If you are fed up with your Samsung and want to switch to iPhone, it is necessary for you to move data from Samsung to iPhone for your convenience. As for how to make use of Samsung Galaxy to iPhone transfer tool to help you, this guidance will do you much help. You can choose Email as the Samsung Galaxy to iPhone transfer tool when you just want to transfer a few files. Here I would like to take photos for instance to explain how to move data from Samsung to iPhone via Email. 1. On Samsung, tap on “Apps” on home screen and choose the “Email” app. After that, click on the compose button at the upper left of the page and enter another email address of yourself or touch the people icon in the page to select the contact number in the list of “Contacts”. Click on “Done” and then tap the “Subject” panel to type a subject and then tap on the input area to enter a message or just leave it empty. 2. Afterwards, click on the paperclip icon at the upper right of the interface and select photos you desire to transfer to iPhone. 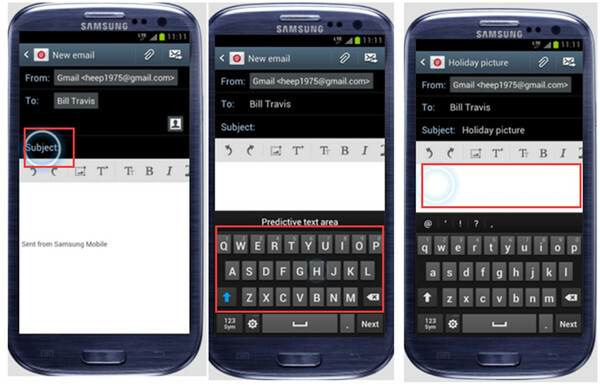 Click on the send button to send the new email to your own email box. 3. On your iPhone, open the new email you receive from Samsung and download the photos to your iPhone by pressing long to click on “Save” button. Thus you can solve how to transfer photos from Samsung to iPhone with a few clicks. This method to fix how to transfer photos from Samsung to iPhone is a bit complex. You can resort to other tools to deal with how to move data from Samsung to iPhone. 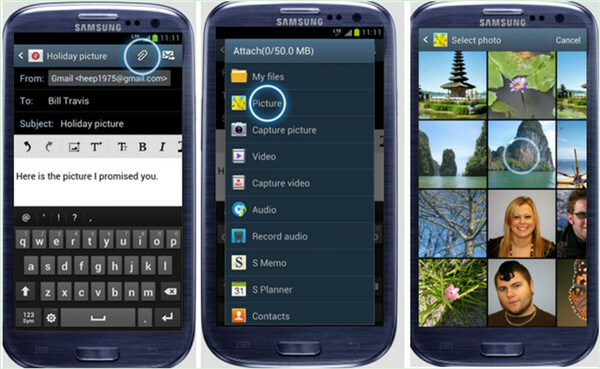 If you want to know more ways, please visit: 3 Ways to Transfer Photos from Samsung to iPhone. Bluetooth can be used as a good Samsung Galaxy to iPhone transfer tool, which can cope with sync issues quite easily. You can solve how to transfer contacts from Samsung to iPhone via Bluetooth or how to transfer music from Samsung to iPhone. Now, let’s see the specific steps on how to transfer photos from Samsung to iPhone with Bluetooth for instance. 1. On Samsung, swipe down the notification shade and click the icon of Bluetooth to enable it. Click on the setting gear icon and click on the tab of “Bluetooth”. On your iPhone, swipe upwards to turn on Bluetooth as well. After that, on your Samsung, you need to choose iPhone under the tab of “Available devices”. Thus, you can see your Samsung and iPhone are paring. 2. 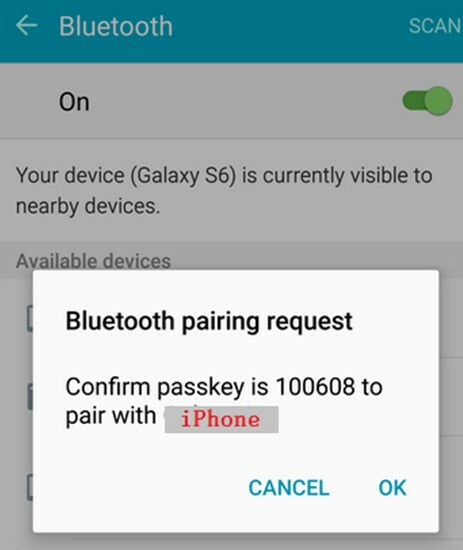 When you see a short passkey on both devices, you need to click on the “OK” button to confirm Bluetooth transfer on both Samsung and iPhone. 3. 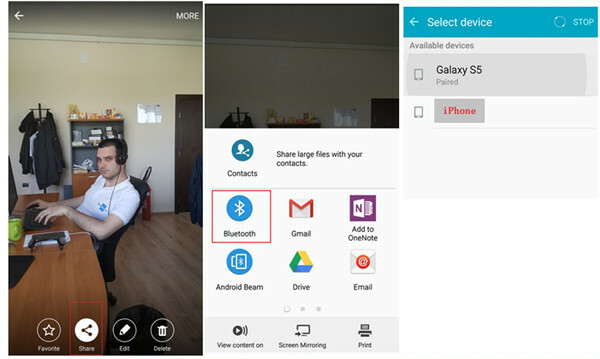 On Samsung, choose the photos you would like to share to iPhone and then click on the “Share” button at the bottom of the interface and then choose “Bluetooth” option to click on. Choose “iPhone” under the tab of “Available devices”. Thus, the transfer process from Samsung to iPhone will begin. On your iPhone, you will get a notification of the file transfer and you need to click on “ACCEPT” button to save the photo file. This solution is quite easy to handle the issue of how to transfer contacts from Samsung to iPhone via Bluetooth as well. As for the transfer of other types of files, this software can also assist you to make it. In spite of contacts, calendar is also a thing that people usually have no idea to transfer, however, you could use Leawo iOS Data Recovery to transfer calendar from Samsung to iPhone. iTunes is developed by Apple Company, which can also be used to solve how to transfer photos from Samsung to iPhone or how to transfer music from Samsung to iPhone without any difficulty. When it comes to fixing how to move data from Samsung to iPhone, you can apply iTunes as the Samsung Galaxy to iPhone transfer tool. As for how to make it, please check out the following contents. Photos will be taken for instance in this method. 1. Insert Samsung and iPhone into computer, and your computer will detect Samsung as one hard drive. Launch iTunes and tap on the icon of iPhone on the left sidebar. Then choose “Photos” tab on the left sidebar under the menu of “Settings > Summary”. 2. Tick “Sync Photos” and “All folders” option. 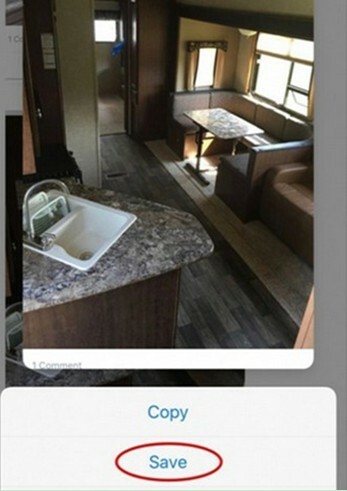 Then click on “Choose folder” in “Copy photos from” to move to your photos folder in Samsung storage folder on computer. 3. Click on the “Apply” button at the bottom right of the window to invoke the sync procedure When the process is over, your Samsung photos will be on your iPhone in Photos app. Note: Before the sync process is ignited, you need to move to “Edit > Preferences >Devices”. In the panel, you need to tick “Prevent iPods, iPhones and iPads from syncing automatically”. 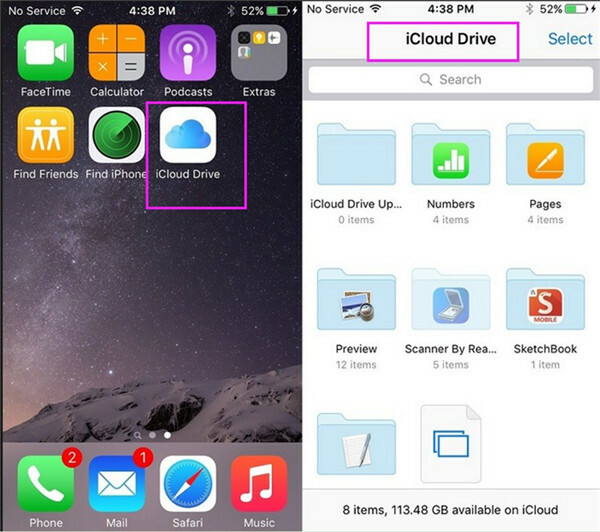 iCloud Drive is also quite convenient for you to move data from Samsung to iPhone. Here I will take photos for example to explain how to use iCloud Drive on computer and iPhone to transfer data from Samsung to iPhone. 1. On computer, log into iCloud for Windows with the same password you are using on iPhone and check “iCloud Drive”. Click on “Apply” to confirm your settings. 2. Connect Samsung to computer via suitable USB cable and computer will detect it as an external hard drive. After that, go to File Explorer’s Quick Access List and find iCloud Drive folder. Navigate to your Samsung storage folder on computer and copy the photos you want to export to iPhone. Then you need to paste the photos files into the iCloud Drive folder. 3. After that, on your iPhone, you need to run iCloud Drive app. The Samsung photos will be viewable on this software. Make sure your iPhone has been connected to good Wi-Fi network. Click on the photos and invoke the menu at the bottom of the interface. In the end, you can click on the share icon to save Samsung photos files to iPhone local folder. If you want to use a more professional Samsung Galaxy to iPhone transfer tool to help you to solve how to transfer music from Samsung to iPhone, Leawo iTransfer will offer you good service. 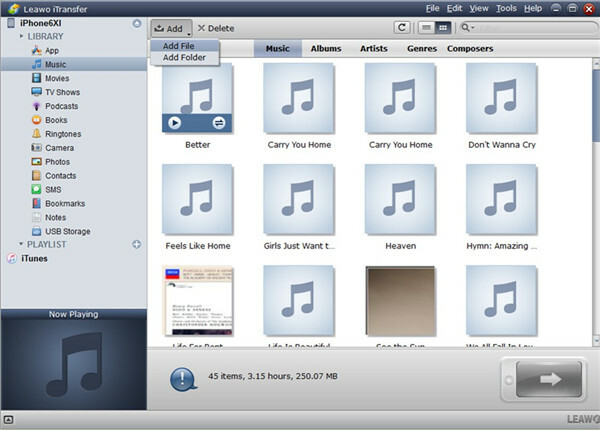 It enables users to manage 12 kinds of files among computers, iTunes and iOS devices. Now you can follow me to read the detailed steps on how to move data from Samsung to iPhone with iTransfer. 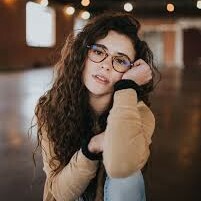 Here I would like to take music for example. Plug Samsung Galaxy and iPhone into computer with matched USB cables. Your computer will recognize Samsung Galaxy as a hard drive. Open iTransfer and it will detect iPhone information automatically. Move to “iPhone icon > LIBRARY > Music” and then click on the “Add > Add File” or “Add > Add Folder” button to browse your computer to locate Samsung Galaxy storage folder to find the music files. Tap on “Open” and the transfer process will start. When the process terminates, your Samsung Galaxy music files will be on your iPhone. More detailed description of this step is here: How to Transfer Music from Samsung to iPhone. If you want to fix how to transfer photos from Samsung to iPhone via iTransfer, you can also refer to the steps shown above. This effective Samsung Galaxy to iPhone transfer tool will help you a lot on transfer issues.